As many as 500 students of 10th and 11th graders from 10 sub-districts in South Jakarta visited to 4 musems, Fatahillah Museum, Wayang Kulit, Keramik, and Joeang 45 Museum. This program was held by South Jakarta Sub-dept. of Culture from April 26-27, 2014. It is hoped the program is able to upgrade their historical learning. 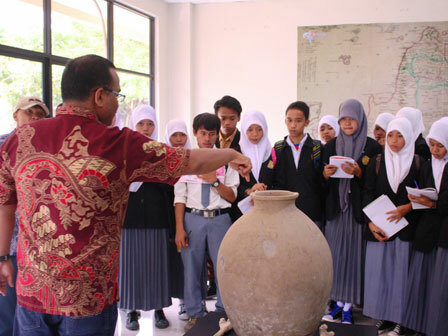 "T he students have to be able to take lessons, including the science and technology equipment, where we could compare the types of technology used in the past and present"
South Jakarta Administration Assistant for Economic Affairs, M. Anwar, disclosed that such program is good in giving lesson and preserve the Indonesian culture history to young generation. "We hope they were able to take lesson from every museum," he disclosed, Sunday (4/27). Similar statement was also said by South Jakarta Head Sub-dept. of Culture, Achmad Syahroni. "Besides seeing the museum collections, the students have to be able to take lessons, including the science and technology equipment, where we could compare the types of technology used in the past and present," he stated. In modern times, he furthered, the nation civilization must remain be conserved, especially among the youngster. Hadiono Arif, (16), one of visitors from SMA in Kebayoran Baru expressed that he was pleased to participate in the program. "It's very fun. Besides that, we can also know the past through the collections of the museum," he exclaimed.